I’m a bit behind on posting lately, and it’s because school is taking up more time than I’d anticipated thanks to a greatly increased student enrollment. I’ve also gotten involved in more volunteer work and now I’m private tutoring again. Weekends this fall are all booked, each with something different to do. I think my first free weekend is in November! I think my next post needs to be about balance, because I feel like I have none right now. I also need to schedule an appointment to see my doctor soon, as she wants 3-month labs. I also need to ask her about the terrible edema I’m having in my legs. No matter how much I drink, move, or control my sodium intake, I get horribly swollen legs nearly every day. I can’t wear regular shoes, it’s that bad. It was never this way pre-op, and I moved less, drank less, and ate way more salt! In the meantime, here’s what I’ve eaten the past two days. 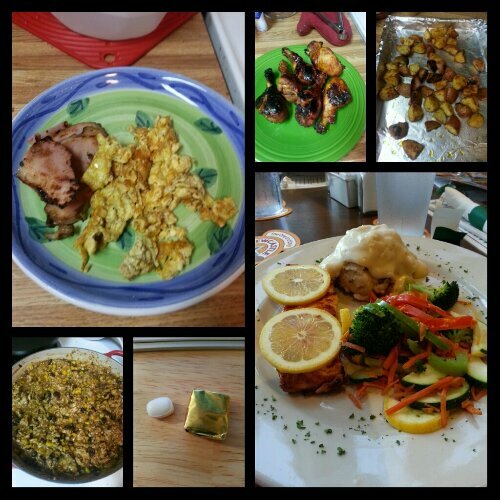 Food choices for September 26, from upper left: scrambled egg with Rudy’s smoked ham slices; honey barbecue chicken and roasted seasoned potatoes; grilled salmon, mixed veggies and a bit of mashed potatoes (I tried to avoid the gravy as much as possible! ); multivitamin and calcium supplements x2; chicken taco filling. 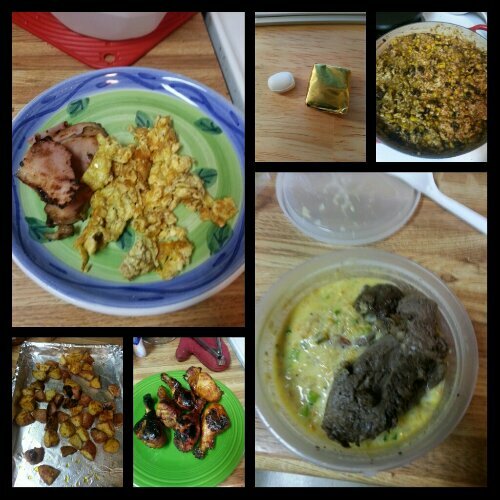 Food choices for September 25, from upper left: scrambled egg with Rudy’s smoked ham slices; multivitamin and calcium supplement x2; chicken taco filling; leftover honey garlic marinated flank steak with leftover baked potato soup; honey barbecue chicken drumsticks and roasted seasoned potatoes. I’ll add the captions later when I’m at my computer. This entry was posted in daily bites, la guerra, post-op, vsg, weight loss surgery and tagged daily bites, eating, post-op eating, post-op life, VSG, vsg realness, WLS. Bookmark the permalink. I love seeing your food choices ! Yours always look more appetizing than mine . I am constantly weighing and measuring , do you weigh them before you eat or after several months you can just eye them ? I weigh everything, unless I go out to eat, and then I underestimate. Indeed to be better at weighing !!!! I am always putting too much on my plate ! Weighing and counting have become an absolute necessity so that I don’t get overly full to the point of uncomfortableness. One of the best pieces of advice I have gleaned from reading the VSG forum that I read daily is to “undereat your sleeve’s capacity.” I would do this as much as possible because it is possible to feel satisfied without stuffing oneself, which is more likely when food is not carefully measured/weighed out. It is a tedious task but a necessary one.